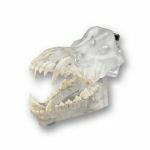 Provides the closest simulation to real life animal dentition by way of anatomical relationships, tooth hardness, gingival density and jaw articulation. Makes it possible to practice every aspect of dentistry including tooth extractions, periodontic and prosthodontic techniques, cavity preparation and routine cleanings. Model Size: 4" x 3" x 2". 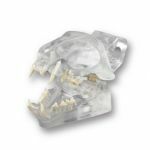 Made of durable, hi impact plastic materials accurately designed and lesions or other abnormalities as described below. Canine Anatomical Skeleton Large (Bosley Dog) Mounted 49:" x 23"